When it comes to washing windows and glass fences in Southern California, we can’t rely on the rain to do the job for us. Instead, most homeowners delay washing exterior glass for a variety of reasons. Sometimes, it’s because dirt isn’t visible to you based on the way the sun shines and other times, it’s the usual culprit—procrastination. San Diegans living near the airport may have the additional problem of jet fuel landing on glass fencing and windows, making regular cleanings a necessary evil. In addition to dirt and bird droppings, yellow spots thought to be excrement from honey bees and other insects are also problematic because they take major elbow grease to remove. The truth is that cleaning your own exterior glass can be an easy and inexpensive task, if you stay on top of it. Believe it or not, many experts suggest that a simple mix of non-abrasive dish soap (a tablespoon or two), water and a squeegee is all one needs to clean glass (in addition to a positive attitude). Let’s face it, we hire out or the task gets put off because we don’t like to do it. Those of you with two-story homes can buy a squeegee with a pole extension or hire a professional (a very reasonable alternative) to reach tough spots. Often hailed for its cleaning properties, some substitute distilled white vinegar (50% vinegar and 50% water mix) for dish soap. 1. Consider sunlight. While California sunshine can dry a cleaning solution onto glass at an annoying rate causing water spots and streaking, it can also reveal dirt, grime and streaks that might otherwise go unnoticed. 2. Brush the dirt off first. Use a non-abrasive sponge or extremely soft bristled brush to shake dirt off the glass, railing or sill. 3. Soak caked-on debris like bird droppings to loosen them off the glass. Try not to scrub as any grit that’s passed through the bird’s system could scratch the glass. Speaking of bird droppings, wear gloves and dispose of them properly as they are a health hazard. 4. With a mixture of hot water and dish soap or vinegar, wet the squeegee and swipe from top to bottom or use the snake method on larger panes, which involves continuous horizontal strokes from left to right, in the shape of an “S”. 5. Wipe the squeegee off between strokes and make sure that none of the dish soap or vinegar residue lands on window sills or railings. If it does, rinse them thoroughly with water. That’s Great, But What About Streaking? — Wipe the outer inch or so of your window with black and white newspaper first so that it’s completely clean and dry. Some say that the key to avoiding streaks is to start the squeegee off in a totally dry spot and swipe from there. — Add a few tablespoons of lemon to the cut dirt and grime. — Dry the glass with newspaper. Toss the colored ads and comics and use just the black and white pages. Newspaper is lint free, which is why it works so well on glass. As the ink quality of newspaper can vary, test yours on a small part of the glass to see if it smudges. — Use distilled water, especially if you have hard water, as distilled water lacks minerals that can lead to streaking. — If using dish soap, minimize suds. Too much soap can result in an overly-dense cleaner prone to streaking. — Forget paper towels of any kind as they are full of lint. Use a microfiber cloth or chamois instead. — Don’t allow the squeegee to leave the glass. Think that’s impossible? Watch this video. With coastal and mountain views, glass fencing is a popular choice for Southern California homes. Because it’s a bit pricier than the alternatives, it makes sense to keep the glass and its usually powder-coated aluminum base clean. As we discussed with patio furniture, leaving the elements can corrode and shorten the lifespan of the powder-coat (especially salt from ocean air), which is blasted on at high heat and not easily repaired. 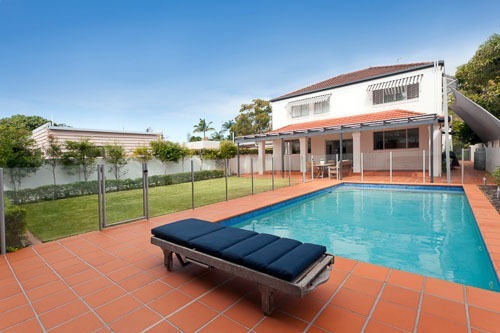 However, the pros of glass fencing outweigh the cons to most homeowners who can stomach the price tag. Glass (obviously) doesn’t obstruct views while being incredibly strong even in the harshest of elements. And, choosing glass to surround a swimming pool is not only aesthetically pleasing—it’s resistant to chlorine corrosion. The irony is that one of the major cons of glass fencing when clean is that birds, other wildlife or even you (when not paying attention) can’t see it unless its dirty. Expect a stunned bird or two. Also, tempered glass is required by law so we’re assuming this is what you have unless your fence was grandfathered in due to age. 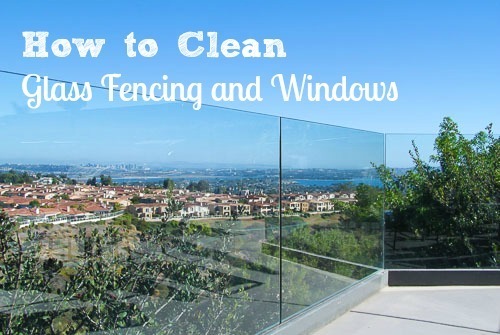 Use the techniques mentioned above to clean a glass fence, but because they are even more exposed to nature than exterior windows (two sides versus one without the protection of eaves), they require more frequent cleaning to keep the gunk off. 1. Razor blades must be clean. And, we actually mean almost spotless. Picture a razor blade swiped over a dirty window that does its job by picking up a serious amount of grime that coats the blade. If not wiped completely clean, a speck of dirt, glass shard or remnants of whatever landed on your window can scratch the glass with another meaningful swipe. Sure, some argue that a dirty squeegee may have the same effect but, seriously, we all know a squeegee can’t scrape a window nearly as closely as a razor blade can. 2. Razor blades must be used properly. Apply ever-so-slight pressure to the left or right with a little bit of grit on the blade may equal a scratched window. We had a very reputable window washing company scratch hundreds of “rainbows” (using a professional safety scraper) into a very expensive glass fence, only made more visible by sunshine. And, we have a lot of sunshine in Southern California. 3. Razor blades may void your window’s warranty. At least a few high-end manufacturers have an anti-razor blade clause in their warranties so check yours before you authorize someone to use them. Our best advice? Use razor blades sparingly, if at all. There are certainly repair methods that will buff light scratches out of glass but the price tag might exceed value. How do you keep glass fencing and exterior windows clean?